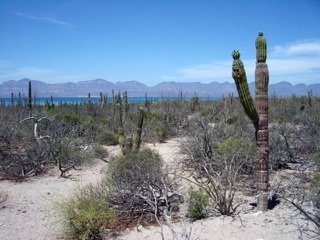 The Sea of Cortez The name alone evokes romance, call like a siren, promises glimpses of Shangri La. It is a magical place, there’s no doubting it. And it’s a biological wonder as well; one that has held the fascination of naturalists and adventurers since the Spanish sea captain Hernando Alarcón first sailed to the head of the Gulf in 1540. Also known as the Gulf of California (both names are equally valid, and both derived from sixteenth century Spanish maps), this great sea is over 700 miles long and spans nine degrees of latitude, crossing the Tropic of Cancer near the city of La Paz. It was created around 6 million years ago, when tectonic forces ripped the Baja California Peninsula away from mainland Mexico, allowing the waters of the tropical Pacific to rush into the newly formed basin. The great East Pacific Spreading Center runs right through the middle of the Gulf, and continues to push Baja (and much of California) away from the North American Plate at a rate of several inches per year. 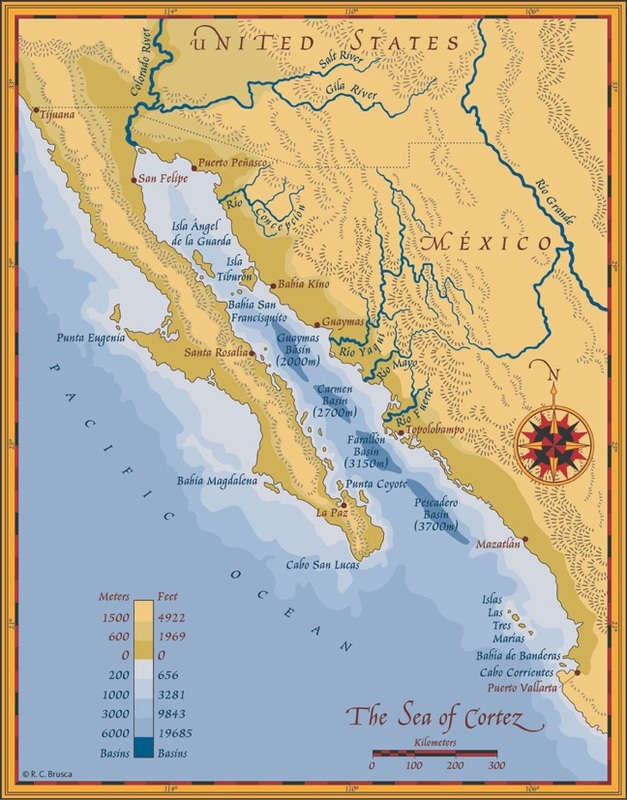 The sea divides the Sonoran Desert into two halves, on the “mainland” and on the Baja Peninsula, with southern Arizona being the capstone connecting the two parts. Its warm subtropical waters, and abundant upwellings that bring deep-sea nutrients and oxygen to the surface, have created one of the most productive and diverse seas on the planet. The Gulf’s 6000 recorded animal species are estimated to represent only about 70% of the actual (total) fauna lurking in its rich waters. So productive is this sea, that about half of Mexico’s total fisheries production comes from the region. So rich in plankton and other marine life is the Sea of Cortez, that populations of two species of migratory great whales appear to have forsaken their ancestral migratory instinct and taken up permanent residence there - sperm whale (Physeter macrocephalus) and fin whale (Balaenoptera physalus). Sperm whales are the largest of all the toothed whales (to 60 ft in length) and are among the deepest divers in the ocean, routinely reaching depths of 3000 ft or more; their major prey, the jumbo (or Humboldt) squid (Dosidicus gigas) can weigh more than one hundred pounds. Jumbo squid have become so abundant in the Sea of Cortez, that these days on a good night local fishermen may pull in 10,000 pounds or so, in one locality. However, abundances of this squid fluctuate dramatically from year to year for reasons we are only just beginning to understand. Seven marine reptiles inhabit the Sea of Cortez, five threatened/endangered sea turtles, one sea snake (Pelamis platurus), and one crocodile (Crocodylus acutus). 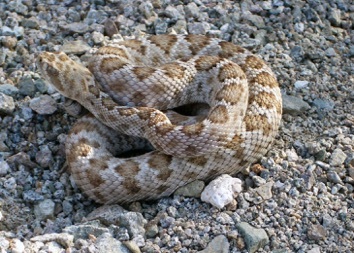 The direct influence of the Sea of Cortez even reaches Tucson, and much of the Southwest, in the form of summer monsoons. Once thought to originate in the Gulf of Mexico, we now know that almost all of the summer monsoon rain comes from the Gulf of California/Tropical Eastern Pacific, often in masses of water-laden air called “Gulf Surges” that rush right up the Sea of Cortez to dump their harvested moisture in southeastern Arizona and adjacent areas, making the Sonoran Desert a “maritime desert.” The oceanic waters of the Pacific also rush up the length of the Gulf, twice daily, and as they funnel into the shallow, narrow uppermost Gulf, they create some of the world’s largest tides—up to 24 vertical feet at Puerto Peñasco (“Rocky Point”) and over 30 feet at the very head of the Gulf. On shallow tidal flats in the northern Gulf, a 20-30 ft vertical fall can expose kilometers of twice-daily-submerged seabed, with the sea rushing back in just a few hours later. Many a naive tourist has watched the sea swallow their off-road vehicle with these rapidly returning tidal waters. On average, more than 25 X 109 m3 of tidal water flushes into and out of the Upper Gulf daily; more than the entire flow of the Colorado over an entire year! With over 900 islands and islets, the Sea of Cortez is home to one of the world’s largest island archipelagos. 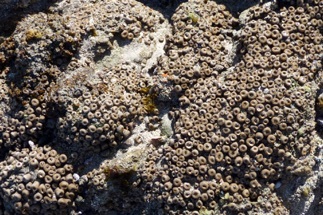 Take a short photo tour of some Sea of Cortez islands and their inhabitants, below. 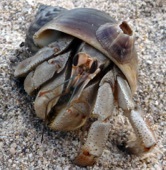 • To access an interactive/searchable database on Sea of Cortez invertebrates, click here. 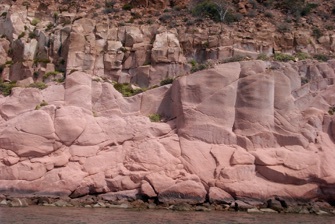 Isla San José has exquisite sandstone fossil beds and a rich flora. 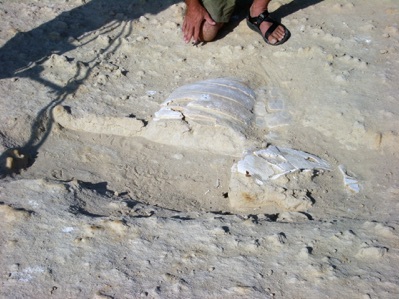 Shown here are the richly vegetated island (with Baja California in the background), the Dr. Seuss-like elephant tree or torote (Bursera microphylla), and a turtle fossil (being examined by Jeff Seminoff). Isla Espíritu Santo, which broke off from the Baja Peninsula as it pulled away from the mainland, is legendary as one of the most mystical and beautiful of all the Gulf islands. Shown here are its red Miocene volcanic tuff cliffs, and David Yetman and Rick Brusca kayaking in the old Pearl Oyster Lagoon on the island’s west coast (Bahía San Gabriel), built around 1906 by Gastón Vivés, a French-Mexican entrepreneur living in La Paz. Vivés’ operation came to an end in 1914, when it was destroyed by the “Constitutional Army” during the Mexican Revolution. 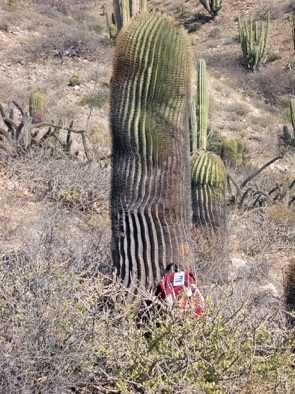 Isla Santa Catalina is famous for its giant plants, rattleless rattlesnakes, and other bizarre natural wonders. 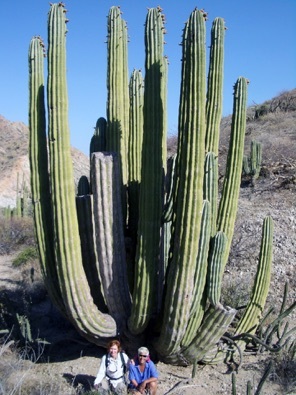 Shown here are giant barrel and cardón cactuses, and the famous rattleless rattlesnake, Crotalus catalinensis. 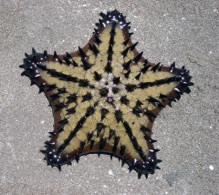 The islands of the Sea of Cortez are the last refuge for large coastal invertebrates that have been reduced in numbers (or entirely decimated) from most of the mainland coast and much of the Baja coast. 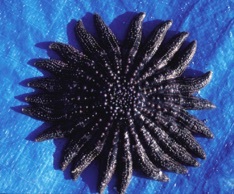 Shown here are three common island seastars (left to right): Oreaster occidentalis, Nidorellia armata, and Heliaster kubiniji. 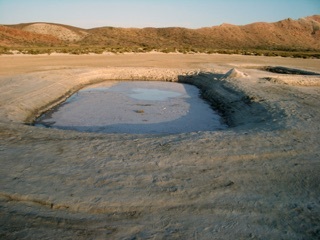 Isla San Francisco has salt pans that have been excavated by a family of fishermen (from Isla Pardito) for decades. 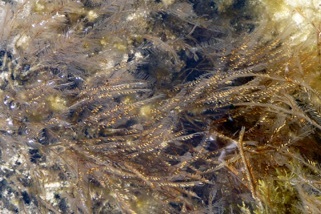 The salt is used to preserve fish in this region where electricity and refrigeration is uncommon. 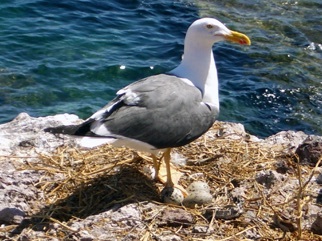 Yellow-footed gulls are endemic to the Sea of Cortez, relying on a few of the Gulf’s islands for nesting sites. 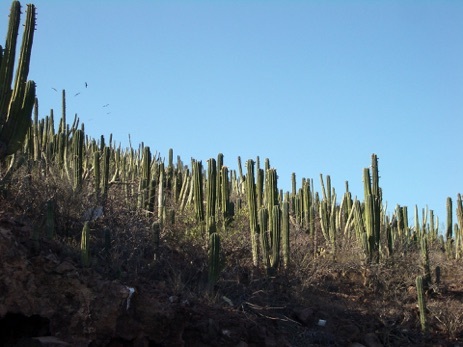 The small island of Isla San Vincente (bottom photo) in Guaymas Bay is lush with cardón cactus, probably due to the absence of seed predators (e.g. rodents), at least until recently. 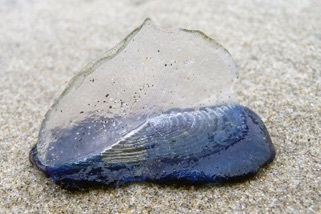 Four common island cnidarians (left to right): Portuguese man-of-war (Physalia utriculus), beached; a by-the-wind sailor(Velella velella), beached; colonial zoanthid “anemones” (Palythoa ignota); and, feather-plume hydroids (Aglaophenia inconspicua). 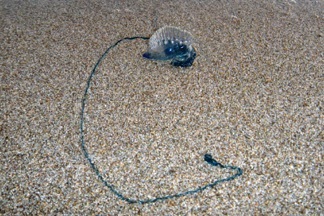 The Portuguese man-of-war can inflict a painful sting on unsuspecting swimmers, but with hot water compresses it dissipates in 30 or 40 minutes. 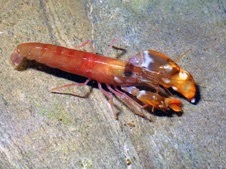 Three common island crustaceans (left to right): a snapping shrimp (Alphaeus sp. 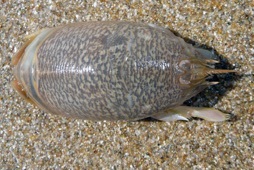 ), the semiterrestrial crab Coenobita compressus, and a sand crab (Emerita rathbunae). 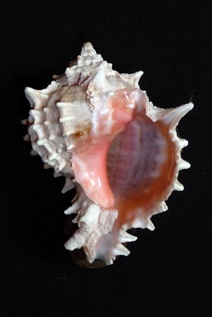 Five common island molluscs (left to right): Pink-mouth murex (Phyllonotus erythrostomus) were once so common in the intertidal that one couldn’t take a step without them being under foot—today they’re gone from tidepools on the mainland, being found mainly subtidally and on offshore islands. 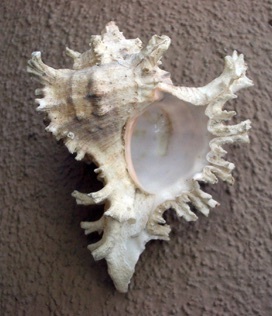 Regal murex (Chicoreus regius) and tent olives (Oliva porphyria) have also become rare due to shell collectors. 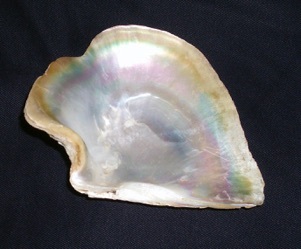 The pearl oyster (Pinctada mazatlanica) is famous for its black pearls, although most of the fishing grounds have been fished out (no longer enough oysters to be commercially viable). 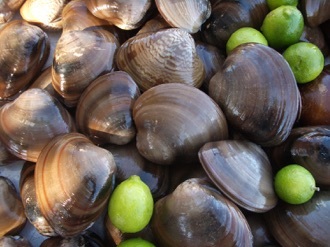 “Chocolate” clams (Tivela planulata), a close relative of the famous California Pismo clam, are some of the best eating shellfish in the Sea of Cortez—because they are hand collected for local markets, they are not being depleted in the wild. 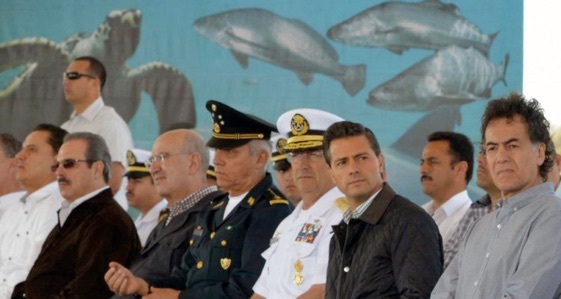 In April 2015, President Enrique Peña Nieto (second from right) and World Wildlife Fund-Mexico’s General Director Omar Vidal (far right) announced dramatic new plans to save the vaquita from extinction. 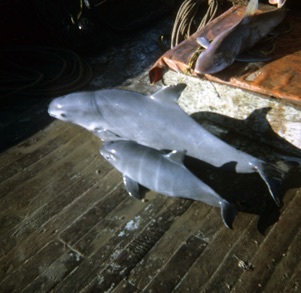 Included in the plan is an expanded protected (no fishing) zone, an absolute ban on gill netting in the region (with financial compensation for fishers), and patrols by the Mexican Navy. However, the fishing ban has not worked because illegal fishing for totoaba (for their swim bladders) has continued. 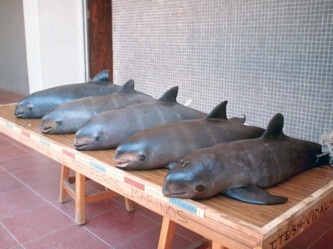 Gill nets are the primary cause of vaquita mortality. 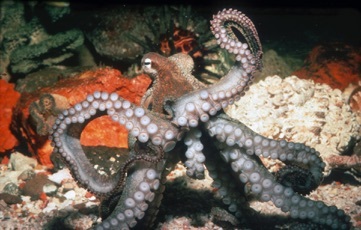 With a mantle/body length up to 18 cm (excluding the arms), Octopus bimaculatus is the largest of the Gulf’s octopuses. Ranging north to Pt. 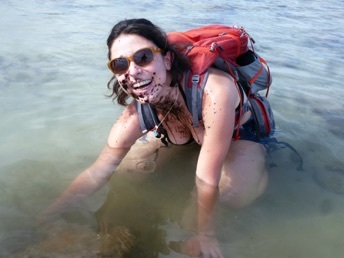 Conception, California, and throughout the Gulf, it is easily recognized by its pair of colorful eyelike spots (sometimes called “ocelli”), and it goes by the name “two-spot octopus.” The precision with which it can eject its ink is dramatically shown in the photograph of invertebrate zoologist and tidepool enthusiast Laura S. Zamorano. The octopus was in a tidepool (in Puerto Peñasco) but squirted its ink stream through both the water and two feet of air to hit Ms. Zamorano in the face and chest! 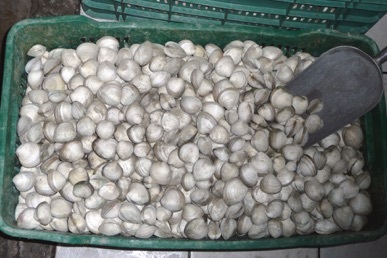 Octopus bimaculatus is heavily harvested by fishers in the Gulf. 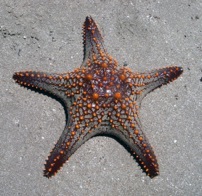 There has been some suggestion that the Gulf populations might represent a different species, or subspecies, than the California populations. Mexico takes conservation seriously. 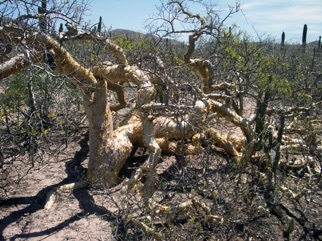 As of 2018, there were 61 protected areas in the Sea of Cortez, including: Biosphere Reserves (Mexico-designated), Areas for Protection of Flora and Fauna, National Parks, Fishery Refuges, and Ramsar Wetlands of International Importance (and including two “decreed areas” in the Northern Gulf). 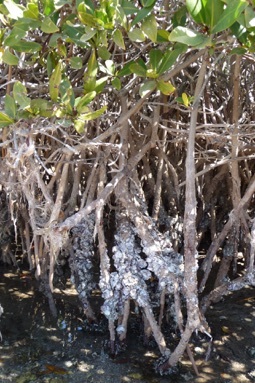 These protect about 30,000 sq km (~11 percent of the Gulf’s area). However, federal budgets and enforcement are insufficient and corruption continues to undermine conservation efforts.